Drama. An investment is just and only the purchase of risk, and the risk is that we might not get our money back and a hopeful return above the rate of inflation, which, if we don’t, is just another way of losing our money because we can buy less later with our money than we can buy now. All of that can be re-stated as “an investment is just and only the purchase of risk and the risk is that we might not obtain a non-negative real rate of return”; and, when stated that way, the definition of an “investment” and “risk” is equally evocative in cases of inflation, which is the norm and our “money” as cash in our pocket can be expected to buy less in the future than it can buy now, and deflation in which our “money” as cash in our pocket can be expected to buy more in the future because the demand for goods and services has waned, or, in some cases, the supply of goods and services has waxed and the market is flooded with goods and services for which there are not enough buyers. That simple paradigm keeps us fully invested in the “equities” market, at all times, because we can show – prove in mathematical and economics terms – that the “cash” in our pocket can never be as “good” as an investment that is both “as good as cash” and “better than money” when we buy it (the investment) at a “price” that we can calculate as the “price of risk”. For more on these concepts, please see our recent Post, Bystanders & Collateral Damage, which provides more information and references. Large investors, such as mutual funds, endowment and trust funds, and pension funds, address the exact same problem of a return on “cash” as “money” when it is invested, by strategically shifting their investments between their portfolio of equities, and their portfolio of bonds which are priced according to the demonstrated inflation now and their expectation of a different rate of inflation in the future. Such as, typically, 60% bonds/40% equities expecting “lower inflation” than now, or 40% bonds/60% equities expecting “higher inflation” than now. For example, if the rate of inflation is high, now, then bonds can only be sold at a serious discount, and we can buy $100 a year from now, for $95 now, reflecting a known 5% rate of inflation and the anticipation that it will not go any, or much, higher; if it does, then the price of their bonds will go down, and if they have an unanticipated liquidity problem, then they might have to sell them at a lower price than what they paid for them. On the other hand, if inflation is not high now, but expected to be high or higher later, then we shouldn’t be buying bonds at all because the price of the bonds that we own will go down if inflation is, in fact, higher later. And, on the other hand (again), if inflation is “high” now, why should we expect it to be even “higher” later; what does “high” mean, anyway, when a burgeoning economy can be growing at rates of 6% or more, and it feels good to own companies? The “bond paradigm”, then, is the easiest of all the investment paradigms because there is only one variable – inflation – although it is commonly made much more complicated by buying and selling bonds in foreign currencies so that now we need to consider two or more rates of inflation, and the relations between them (which increase exponentially), and the rate of exchange between the currencies, which is subject to the demand and supply of goods and services, and many surprises such as wars, civil unrest, and natural disasters in strange locales. Notwithstanding all of that, nobody knows how to forecast inflation anyway. “Big” money doesn’t have much choice. The bond market is at least ten times as big as the equities market, and “big” money can only buy so much of a stock without “stating its intentions” and possibly making a bid for all of it. “Big” money, then, needs to buy whole barrels of stock – dozens, if not hundreds of companies – and the barrel could very well have a weak RIM (Research in Motion) or a bad Apple, that they didn’t expect because the companies are bought and sold by the “bag” according to the needs of the Capital Assets Pricing Model (CAPM), which has nothing to do with “investment risk” as we defined it, but only adherence to some vague standard of “volatility” and “co-volatility” to reduce “volatility”. What? Our approach to such large portfolios is, of course, quite different, and it’s different because we know the price of risk for all the equities in them, with at least the same certainty that a bond holder might know the price of risk for a bond, and why it is what it is. Please see below for more information and additional references. Which brings us to the real goat of the day and the partisans of The New Wave Markets – small investors with $10’s of thousands or possibly some millions, to “madly” invest (The Street, May 13, 2013, Cramer’s ‘Mad Money’ Recap: A Surreal Market). As we noted above, for every $1 invested in the equity markets, there’s at least $10 invested in the bond markets, and when the latter start to move from 60/40 to 40/60, tired of the real sub-zero yields, then, “This is not just a pipe”, anymore, and we’d better believe it. 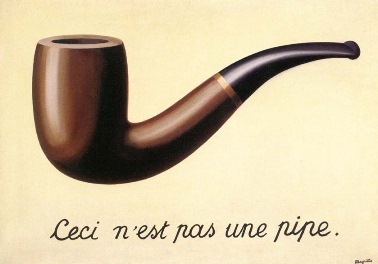 Or be smoked by volatility. Mr. Cramer is now “astounded” that the markets appear to be so “unpredictable” and confound the received wisdom of the ages. He has noted, specifically, that the stock prices of Whole Foods Market, Walt Disney, and Domino’s Pizza, all ran up before their earnings reports – good or bad – but then kept on running and, so, “profit takers” didn’t, instead of “profit takers” do, which is, apparently, the usual thing to do – just take the money and run – because who knows where it came from? 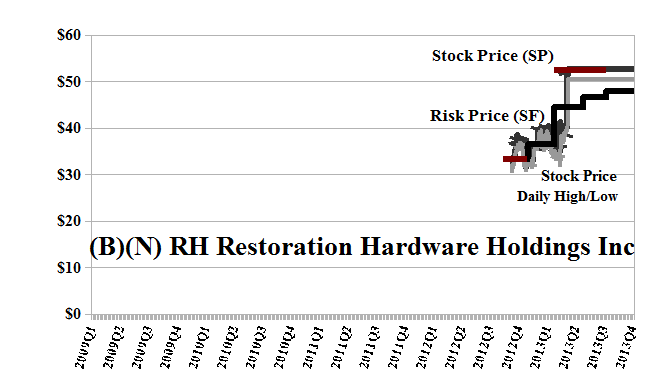 The next challenge to “real analysis” is that the stocks Williams-Sonoma and Restoration Hardware, “gapped higher” but, then, didn’t retreat to fill in the gap, before “gaping still higher” and higher again, with no deference to “consolidating” the gap. And finally, the companies 3M, Caterpillar, and Emerson Electric, all shared “gloomy outlooks” and “dismal earnings” but the stock prices sought the light, and surged upwards. How can this be? Well, it’s easy. All of these companies that didn’t do what Mr. Cramer expected, are in the Perpetual Bond™; and the one company (Caterpillar) that did do what Mr. Cramer expected, just took a little longer to do it, and it is an (N) and is not in the Perpetual Bond™. Caterpillar ran up to $95 and just below the Risk Price (SF) of $95, but then retreated to $87 where it is today. Please see our Post, The Dow (B)-Nots, April 2013, for more details, and for the others, our Posts, The Risk Adjusted Dow, March 2013 for 3M, (B)(N) DIS Walt Disney Company, April 2013, and Whole Foods Market and Emerson Electric, The Wall Street Put, April 2013. Domino’s Pizza Incorporated through its subsidiaries is engaged in retail sales of food through Domino’s Pizza stores; sales of equipment and supplies to Domino’s Pizza stores and receipt of royalties from domestic and international Domino’s Pizza franchisees. Its head office is in Ann Arbor, Michigan. 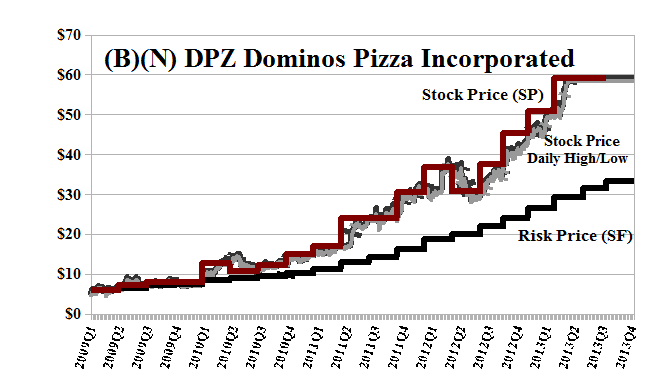 Dominos is a kind of financial phantasmagoria because its net worth is grossly negative (minus $1.3 billion) and several times below its total assets ($500 million); it pays a total dividend of $45 million per year for a current yield of about 1.5% on gross revenues of $1.7 billion. 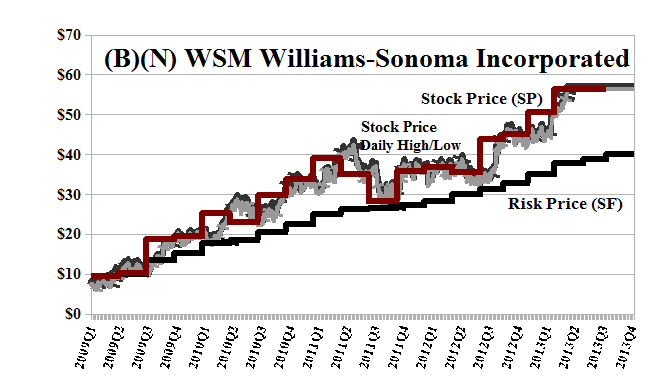 Williams-Sonoma Incorporated is a multi-channel specialty retailer of home furnishings in the United States and Canada, based in San Francisco, California. Restoration Hardware Holdings Incorporated operates as a luxury brands in the home furnishings marketplace offering furniture, lighting, textiles, bathware, decor, outdoor and garden, as well as baby & child products from Corte Madera, California. It came out as an IPO at $24 in November last year.